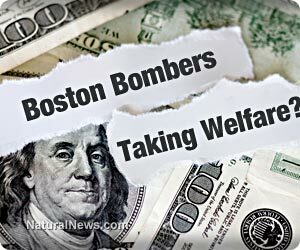 (NaturalNews) In one of the more bizarre developments surrounding the Boston Marathon bombings, it appears as though federal and state taxpayers subsidized the attack. According to the Boston Herald newspaper, Tamerlan Tsarnaev, the accused "mastermind" behind the attacks who was killed in a shoot-out with police within days of the bombings, "was living on taxpayer-funded state welfare benefits even as he was delving deep into the world of radical anti-American Islamism." State officials told the paper that Tsarnaev was receiving benefits along with his wife, Katherine - who had converted to Islam - and their three-year-old daughter. Officials with the Massachusetts Office of Health and Human Services said the benefits ended in 2012, however, when the couple no longer met income eligibility limits. Also, both of Tsarnaev's parents received benefits, and the brother bombers - Tamerlan and Dzhokhar - were benefit recipients through their parents when they were younger, the paper said, quoting state officials. The news raises questions over whether Tsarnaev financed his radicalization on taxpayer money," said the Herald. Earlier reports, as well as relatives, have said Tamerlan's plunge into Islamic extremism began sometime around 2008 or 2009, when the ethnic Chechen first met a convert who has been identified only as "Misha." It was after then he began to become more devout, seeking out jihadist and conspiratorial websites, as well as "The Protocols of the Elders of Zion," a radically anti-Semitic screed. In 2009, the bombing mastermind was quoted in a photo essay as saying, "I don't have a single American friend, I don't understand them." He also said he believed Americans had lost their "values." Ruslan Tsarnaev, the brothers' uncle, said it was about that time Tamerlan stopped drinking and devoted himself to "God's business," while his mother, now wearing a hijab (Islamic headscarf) - started discussing conspiracy theories about the Sept. 11 attacks to her cosmetology clients she said her son had related to her. Tamerlan first came to the attention of the FBI when the Russian FSB, Moscow's intelligence agency, contacted the bureau to warn that he was suspected of being a dangerous radical. "The request stated that it was based on information that he had changed drastically since 2010 as he prepared to leave the United States for travel to the country's region to join unspecified underground groups," the paper said, adding that the FBI reported finding no "terrorism activity." By mid-2011 Tamerlan was being monitored by the FSB. This was before he took a six-month trip to his former home in Dagestan in 2012, where reports said he attended a notoriously radical mosque. The Herald reported that state officials would not say when the Tsarnaev's began receiving taxpayer benefits. But Alec Loftus, a spokesman for the state HHS, said they "were not receiving benefits at the time of the incident," a reference to the bombings that killed three and injured 260 others. Loftus, the paper said, declined to discuss the kinds of benefits or the amounts the family received. What appears clear, however, is that the family in general, and the bomber specifically, had been receiving benefits at least for a time while he was being radicalized, if not while he was actually planning his attack. Furthermore, as products of the state's public education system, taxpayers supported both brothers as they made their way through grade and high school. Then there is the fact that, while living in Massachusetts, the brothers and their family took advantage of other tax-supported agencies and departments of the city. Some of the fundamental critiques from Islamic extremists about America center on our society: our form of government and our culture. Yet clearly hypocrisy - such as the Tsarnaev's taking advantage of those very things for as long as they suit them - is okay in Allah's eyes. It's no wonder too few Americans truly understand Islam. We seldom see its peaceful, logical side.